not limited to pre-printed towels or linens. We make our own, and do so with creative flourish. 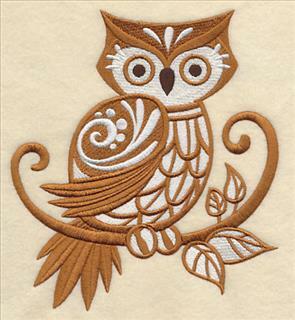 Embroidery Library has more than 100,000 designs to inspire your creative muse. 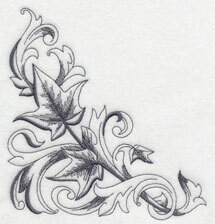 And, we draw and digitize new designs every week, so we're always keeping up with the latest. 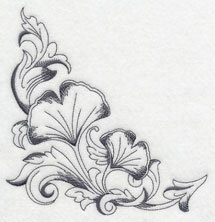 These new designs are replete with flourish, filigree, charm, and charisma. The themes and subjects are varied! 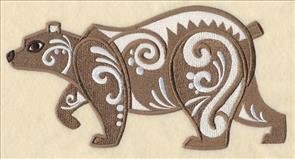 Below you will find animals with elegant detail on their bodies and tails, and light-stitching motifs for bed linens. Christmas is only two months away, so there is an exciting variety of holiday designs, too. Snowball quilt blocks are classic frames for your favorite subjects and styles! 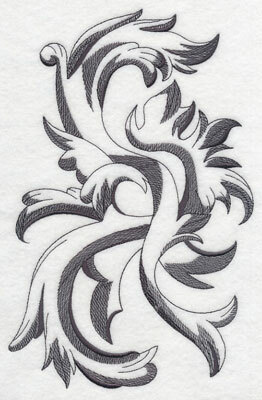 Woodland animals have ornate and elegant flourishes on their wings, bodies, and tails. These designs have retro flair and a whole lot of style! Stitch them onto quilts, towels for cabins, campers, and bohemian residences, and reusable totes for the grocery store and farmers market. 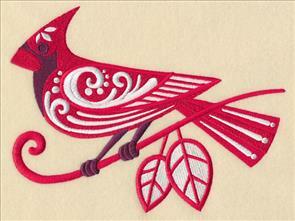 5.86" x 6.54" and 4.87" x 5.42" and 3.46" x 3.86"
A stylish chickadee and cardinal are lovely on pillow covers, apron fronts, and table linens. The designs use only a few colors, making them quick additions to gifts and decor. 7.75" x 5.86" and 6.40" x 4.84" and 3.86" x 2.91"
A buck and a doe are wonderful for "his and her" gifts. Add them to towel sets and pillows. 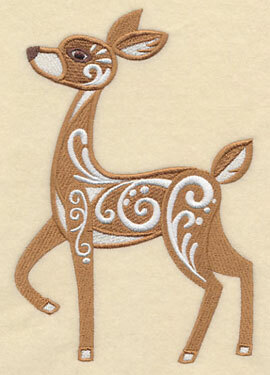 Each deer is decorated with elegant whirls and swirls for an eye-catching and dramatic effect. 4.90" x 7.15" and 3.58" x 5.22" and 2.12" x 3.08"
A majestic moose faces off with a bold bear. 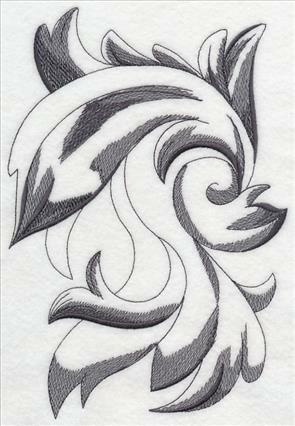 Each animal is drawn in an action pose, with whirls and swirls showing even more movement. These designs use only three colors, making them fast embellishments to fleece pullovers, denim jackets, and corduroy shirts. 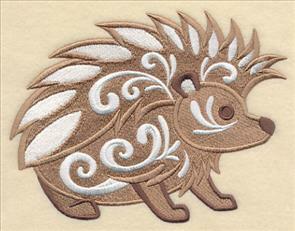 8.51" x 4.42" and 6.86" x 3.56" and 3.86" x 2.01"
This hedgehog and squirrel are forest friends, and each is glorious with elegant whirls and swirls. 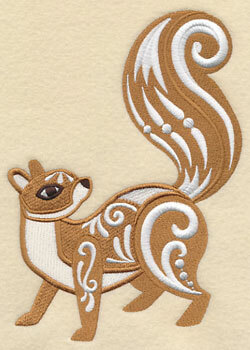 Dots on the squirrel's tail and back leg add a decidedly retro vibe. 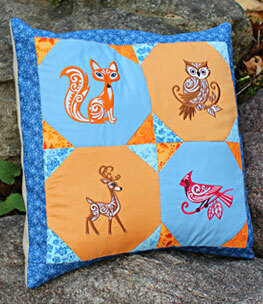 Add these designs to quilt blocks, pillows, and placemats! 5.28" x 7.23" and 4.73" x 6.47" and 2.81" x 3.85"
A busy little chipmunk holds on to a seed, while a wild wolf has an intense gaze. Add to fleece scarves, vests, and denim jackets. 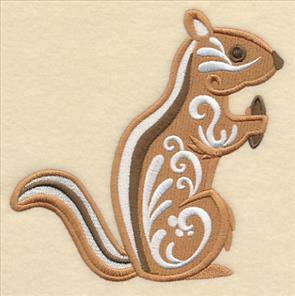 They bring a wild, woodsy fashion statement to shirts and jackets! 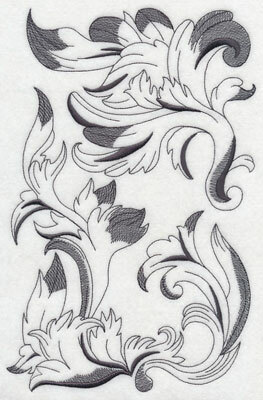 5.86" x 6.25" and 4.86" x 5.19" and 3.62" x 3.87"
The filigree on these animals brings a graceful look to a wild theme. The combination is fresh and stylish! Order the designs singly by using the links above, or get all 12 of the animals in a design pack. 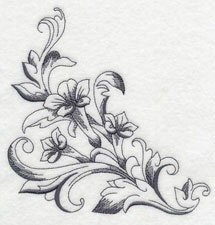 Floral sprays and trios are inspired by classic Hungarian art styles. Bold shapes and bright colors are eye-catching on sweatshirt fronts and jacket backs. 10.76" x 4.86" and 9.39" x 4.24" and 7.80" x 3.52" and 6.86" x 3.10" and 5.26" x 2.37"
The flowers have been separated from the above spray, and are available for purchase. Use them as an accessory to the larger design, or on their own. 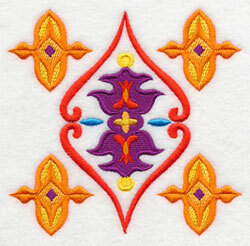 Add them to the corners of washcloths and linen napkins, or the corners of quilts and placemats. 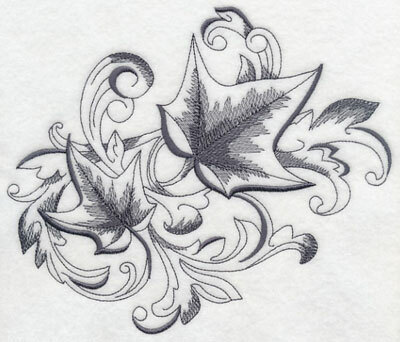 2.72" x 3.50" and 1.53" x 1.96"
These stylized flowers have hard angles, softened by the vines that curve above and below. The combination is classic, and the colors are bold! 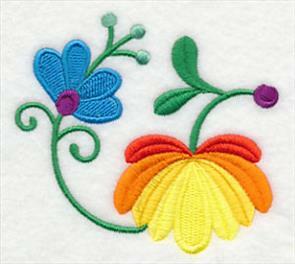 Embroider onto denim; the colors are outstanding! 11.00" x 4.78" and 9.38" x 4.07" and 7.80" x 3.39" and 6.85" x 2.98" and 5.25" x 2.29"
The flowers from the above design are also available for individual purchase. 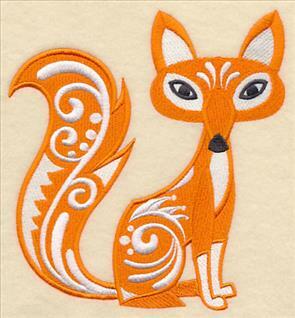 Embroider the large design on the back of a shirt, then tuck a smaller one on the front pocket, or the tail. 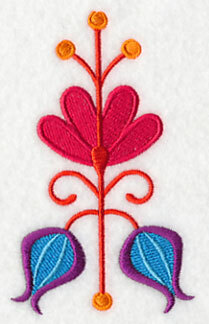 Or, embroider the larger design onto a pillow, then use the smaller ones in the corners. Mix and match these designs any way you'd like - they'll be excellent additions to garments and home decor. 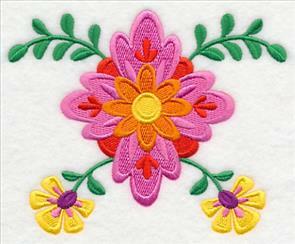 3.36" x 3.27" and 1.88" x 1.84"
Hungarian folk art is fashionable in decorated apparel and home decor. 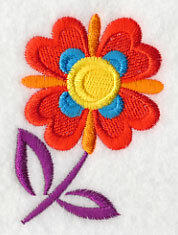 These floral sprays and trios are equally desirable when used on quilts, wall hangings, table linens, and shirt fronts. 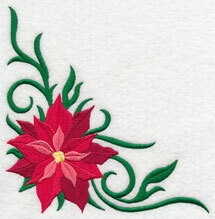 Add them to the bodices of aprons, bath towel sets, and kitchen covers or cozies. Use colors that match your home decor and personal preference. 10.76" x 3.93" and 9.39" x 3.43" and 7.80" x 2.85" and 6.86" x 2.51" and 5.26" x 1.92"
Flowers from the above spray have been isolated and are available for individual purchase. Use them as delicate embellishments to linen napkins, placemats, table linens, and pockets of jeans and jackets! 3.26" x 3.42" and 1.80" x 1.91"
The simple, solid fills in these designs make them suitable for many, many fabrics. Add color and style to fleece blankets, denim jackets, canvas totes, corduroy pillows, suede shirts, and terrycloth towels! One piece of medium-weight cutaway stabilizer is an excellent foundation for all of those fabrics. 10.75" x 5.19" and 9.38" x 4.53" and 7.80" x 3.77" and 6.87" x 3.32" and 5.25" x 2.54"
Flowers from the above spray have been separated and are available for individual purchase. Use in conjunction with the design above, or on their own! They're bright and lively additions to pockets of purses and pants. They're sweet on sweaters and cardigans, too. 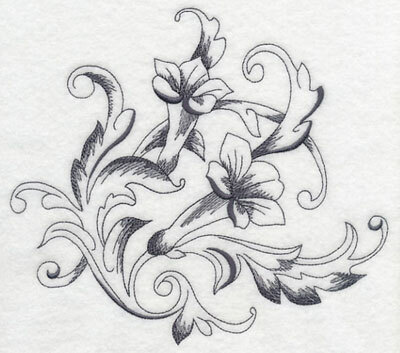 3.00" x 2.06" and 1.73" x 1.16"
This beautiful flower trio has graceful and energetic lines. The colors in the flowers transition from bold to bright! Add to the yoke of a denim shirt, or use as a feature to bolster pillows and tote bags. Color change sheets show the colors that we used to stitch these samples, but experiment with other colors to match your home decor and personal preference. 10.76" x 4.88" and 9.39" x 4.26" and 7.81" x 3.54" and 6.86" x 3.11" and 5.26" x 2.38"
The stylish flowers from the above design have been separated and are available for purchase! 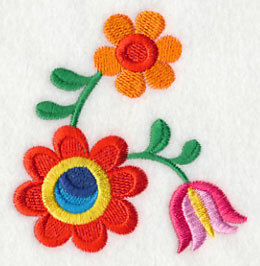 Tuck these colorful creations onto washcloths, shirt pockets, and the legs of denim jeans. 3.78" x 3.45" and 2.12" x 1.94"
The shapes in this design are reminiscent of Art Deco, and the jewel-tone colors are eye-catching! 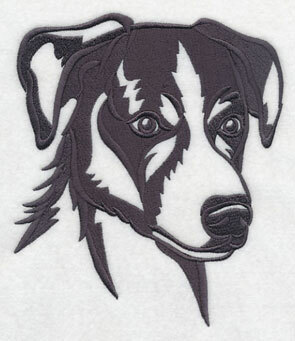 Embroider onto a sweatshirt front or jacket back. Or, use as features for table linens, such as placemats, table runners, and toppers. 10.76" x 5.20" and 9.39" x 4.54" and 7.83" x 3.79" and 6.86" x 3.32" and 5.26" x 2.55"
The designs from the above trio have been separated, and are available for individual purchase. Add these bold and bright designs to shirt pockets, linen napkins, and curtains. Choose colors that match your personal preference and taste! 3.37" x 4.38" and 1.89" x 2.45"
tree skirts, and pillow covers. 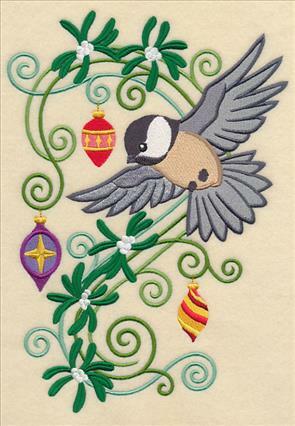 A bright red cardinal and a cheery chickadee are paired with colorful ornaments and festive greenery, all against elegant lines and swirls. 6.91" x 9.74" and 5.53" x 7.80" and 4.87" x 6.86"
spirit to these designs. 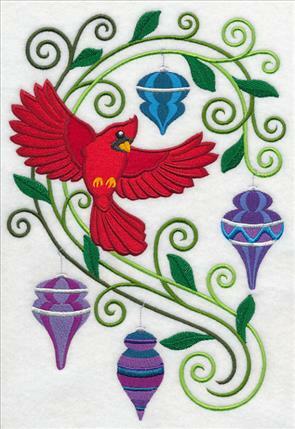 Beautiful when stitched onto stockings, tree skirts, and table runners! 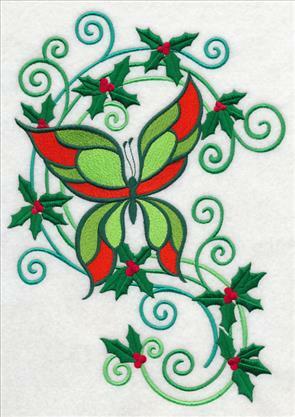 6.90" x 9.69" and 5.55" x 7.79" and 4.88" x 6.86"
A butterfly is dazzling in classic red and green, accompanied by sprigs of holly. 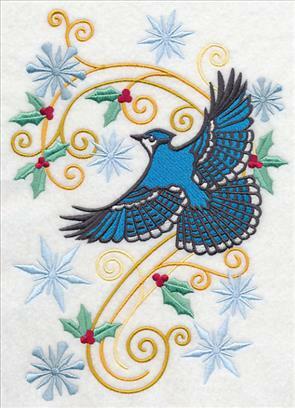 And, a blue jay flies among frosty snowflakes, bringing Christmas spirit and the beauty of winter to your garments and home decor. 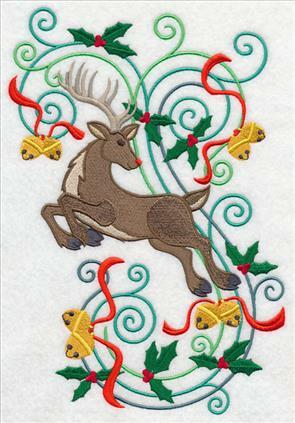 6.77" x 9.41" and 5.62" x 7.81" and 4.86" x 6.75"
A reindeer leaps among jingle bells and holly sprigs. These colorful and energetic elements are set against elegant lines and swirls. 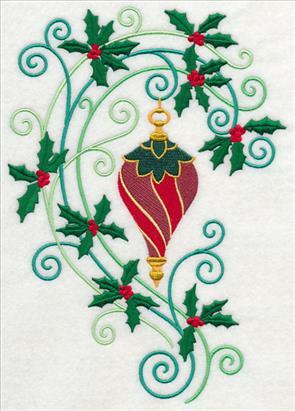 It's sure to make spirits bright when stitched onto stockings and pillow covers! 6.90" x 9.91" and 5.42" x 7.78" and 4.86" x 6.98"
We're getting ready for Christmas, but still enjoying the wonders and beauty of autumn! 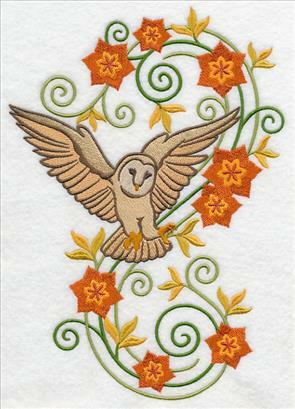 A swallow and a barn owl are posed against flourishes of sleek lines and flowers. 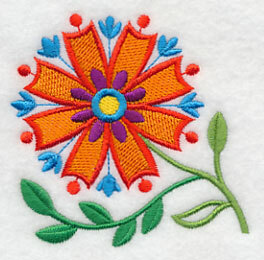 The blooms are stitched in traditional fall shades of orange and gold. Choose other colors for a different effect. 6.89" x 9.80" and 5.51" x 7.83" and 4.85" x 6.89"
Light and open designs are perfectly paired with smooth and neutral fabrics. 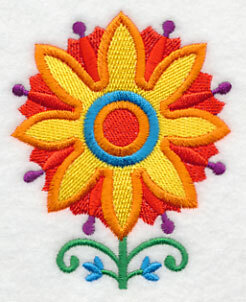 Add these designs to sheets and pillowcases, flour sack dish towels, and quilter's cotton. 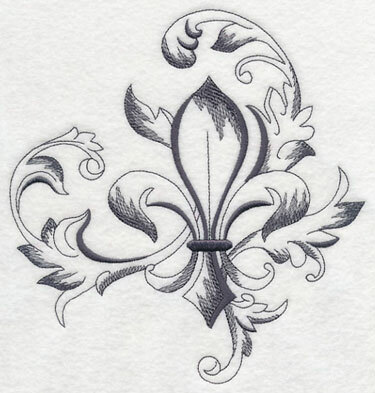 Traditional design motifs include fleur-de-lis, the iconic symbol of France - and Louisiana! 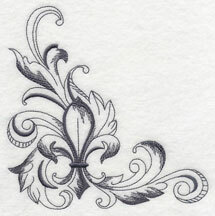 The emblem is set against a whirl of baroque flourish. 7.44" x 7.78" and 6.88" x 7.19" and 5.85" x 6.12" and 4.85" x 5.07"
Corner and border designs are perfectly paired with the above motif. Decorate a set of table linens with Cajun or Parisian flair! Use tone-on-tone colors for a subtle and understated look. Or choose a bright color that contrasts with your fabric, and get ready to be noticed! Trumpet vines are a classic addition to bed linens, and table linens too. They blend beautifully into the baroque flourishes. The design uses only one color, and has light and open areas. It's perfect for the most delicate of fabrics! 7.73" x 6.88" and 6.58" x 5.86" and 5.45" x 4.85"
Add corners and borders to kitchen and bedroom curtains. The designs are very light and airy, and they'll be beautiful on your lightest and breezy fabrics. 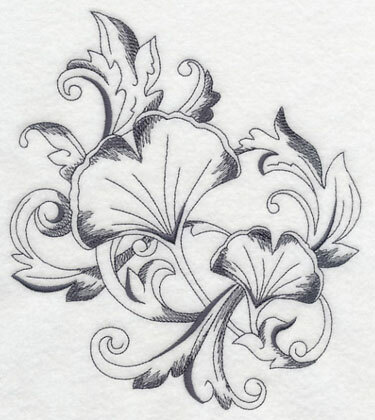 11.73" x 4.15" and 9.38" x 3.32"
7.79" x 2.76" and 6.85" x 2.42"
English ivy, in a whirl of baroque flourish, is a traditional and classic addition to home decor. Add to pillow covers, percale bed linens, and curtains. 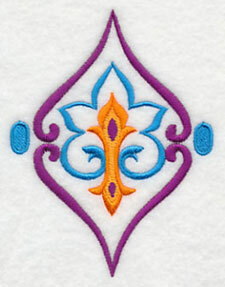 When embroidering light designs onto transparent fabric (like a sheer curtain), use a water-soluble stabilizer. Vilene is an excellent choice. 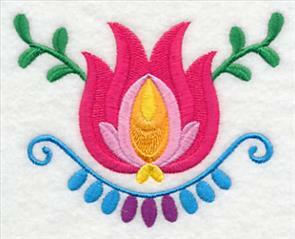 And, use a sharp sewing needle to embroider the design. 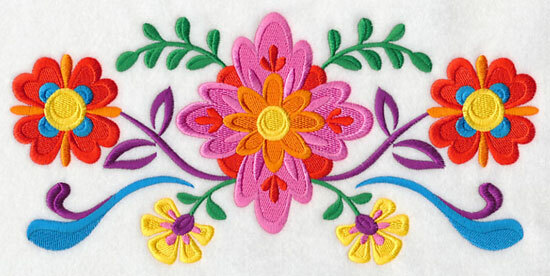 A sharp sewing needle has a finer point than an embroidery needle, and that means it will make smaller perforations in the fabric and stabilizer. The stitches will look crisp, neat, and clean! 7.79" x 6.63" and 6.89" x 5.87" and 5.71" x 4.87"
English ivy weaves and grows in these coordinating border and corner designs. They're light with open areas, and are beautiful on smooth, neutral fabrics. 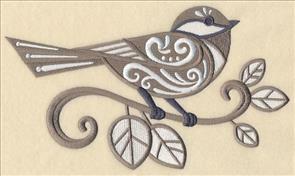 Use them on tea towels, linen table runners and placemats, as well as napkins. 5.86" x 5.98" and 4.86" x 4.96"
11.73" x 4.61" and 9.38" x 3.69"
7.81" x 3.07" and 6.85" x 2.69"
The Ginkgo tree is one of the oldest on earth, and is recognizable by its fan-shaped leaves. They've long been used in home decor; it symbolizes longevity and steadfastness. You may notice it used in bed sheets and duvets, shower curtains, and patterned in upholstery fabric. 6.88" x 7.71" and 5.84" x 6.55" and 4.85" x 5.44"
Matching border and corner designs let you spread the ginkgo theme throughout your home! 5.86" x 5.88" and 4.83" x 4.85"
11.73" x 4.50" and 9.38" x 3.60"
7.79" x 2.99" and 6.85" x 2.63"
These four themes - fleur-de-lis, trumpet vine, English ivy, and ginkgo - are classic in garment embellishment and home decor. You can order the designs singly by using the links above, or get them all in a pack! 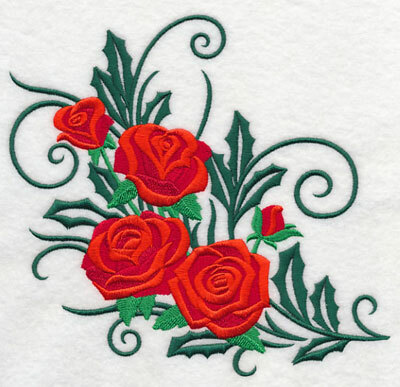 can be used to dress up table linens, bath towels, pillows, quilts, and more! 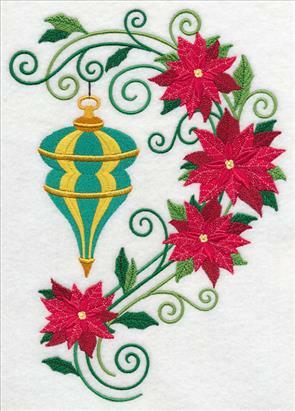 This stylish spray brings the peaceful spirit of Christmas Eve to your gifts, garments, quilts, and wall hangings. 7.65" x 7.80" and 6.89" x 7.02" and 5.86" x 5.97" and 4.86" x 4.96"
A coordinating border and corner are perfectly paired with the above design. 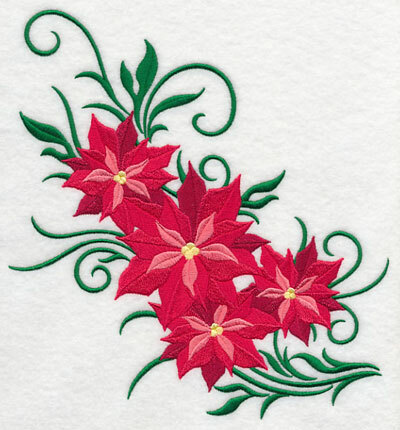 Add the trio of poinsettias to bath towels, placemats, and bolster pillows! The corner is delightful on shirt pockets and linen napkins. 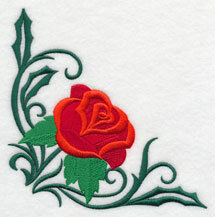 9.38" x 3.92" and 7.81" x 3.26" and 6.00" x 2.70"
Roses grow in classic Christmas colors of red and green. These designs are lovely additions to your holiday gifts and decor. 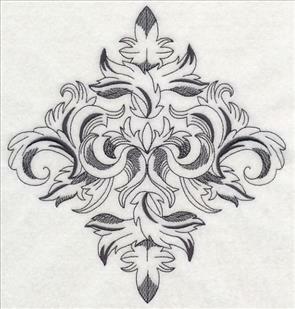 This design is a stunning focal point of a placemat and table runner. Add to kitchen towels for a festive look. 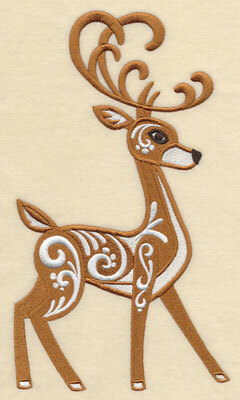 And, place on a stocking for an elegant Christmas decoration! 7.38" x 6.86" and 6.31" x 5.86" and 5.23" x 4.86"
Pair coordinating borders and corners with the above design for beautiful effect. Stitch the main design on a stocking, and use the corner on the toe tip! 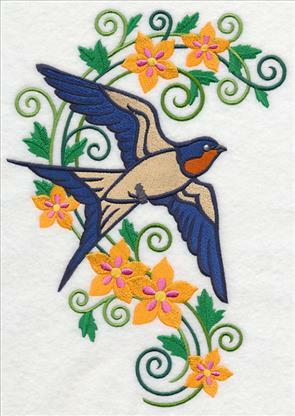 Or, add the feature to a placemat, and tuck the border or corner on linen napkins. Let your creativity bloom and grow with these Christmas roses! 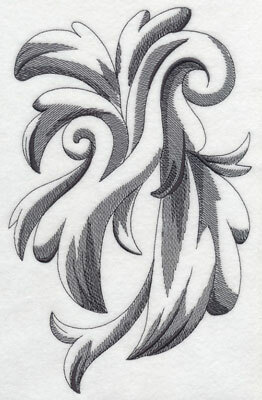 5.90" x 5.86" and 4.86" x 4.83"
9.40" x 4.00" and 7.81" x 3.34" and 6.00" x 2.70"
When we're drawing and digitizing the designs, we sometimes use a light baroque background to add extra style or artistic effect. Many customers have requested those backgrounds to be offered separately so that more designs can be used with them. As always, we're happy to oblige! 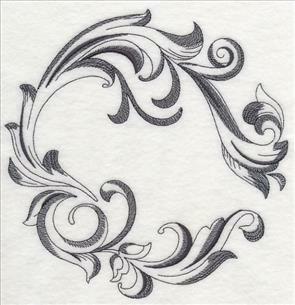 We've created twelve background flourishes in a variety of sizes for your creative uses. If you'd like to see how the design looks with another on top, have a peek at the originals: The design on the left is the background from Gallic Rooster. And, on the right, the background from French Bulldog. 7.32" x 7.80" and 6.85" x 7.30"
5.85" x 6.23" and 4.85" x 5.17"
8.72" x 6.85" and 7.44" x 5.85"
6.17" x 4.85" and 3.85" x 3.02"
The design on the left is one that's used in several of the baroque butterfly designs. 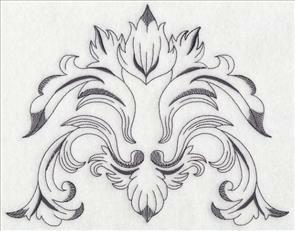 The design on the right is based on the background in Sewing Machine Baroque. 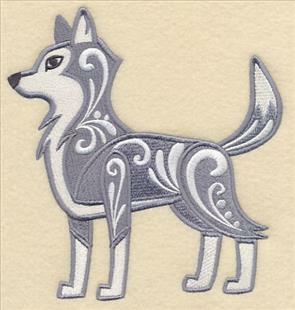 Embroider the background, then embroider your design of choice on top. Or, use editing software to merge both together. 7.71" x 7.80" and 6.85" x 6.93"
11.56" x 6.85" and 9.41" x 5.58"
7.81" x 4.62" and 6.86" x 4.06"
The design on the left is based on the flourish in the Sheaf of Wheat design here. 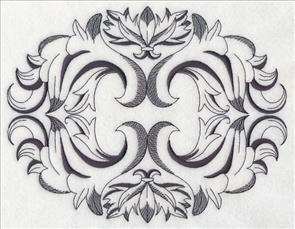 The design on the right is from the Napoleonic Bee Flourish. As well as using these designs with others on top, you can also use them on their own. 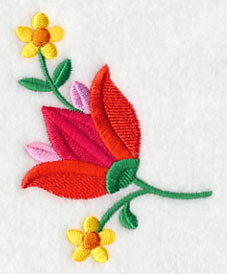 They are light and lovely motifs to repeat on table cloths and runners. 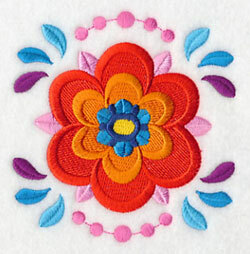 Embroider them tone-on-tone on skirts and shirts for elegant and understated appeal. 8.72" x 6.85" and 7.45" x 5.85"
11.75" x 4.99" and 9.40" x 3.99"
7.80" x 3.31" and 6.85" x 2.91"
The background on the left was originally in the Buckeye Butterflies design. And, the design on the right is the background from the Monarch Butterflies in Flight design. 6.85" x 9.94" and 5.86" x 8.49"
5.38" x 7.80" and 4.73" x 6.85"
6.85" x 10.57" and 5.85" x 9.03"
5.06" x 7.81" and 4.44" x 6.86"
The design on the left is the background from the Dress Form Flourish design. 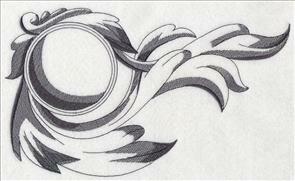 The design on the right is from Wine Tableau. 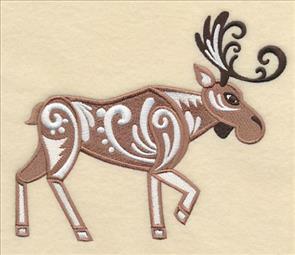 These rectangular shapes will be graceful backdrops to your embroidery designs. 6.85" x 10.74" and 5.85" x 9.18"
4.97" x 7.80" and 4.37" x 6.85"
6.85" x 10.66" and 5.01" x 7.80"
4.40" x 6.85" and 2.47" x 3.85"
The design on the left is from the Sewing Notions Flourish design. 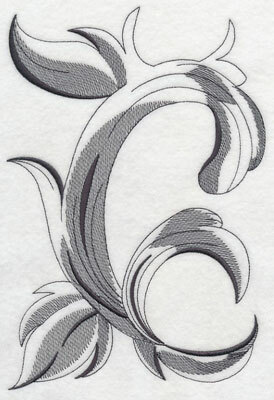 The design on the right is the background from Peacock Flourish. These backgrounds make a lovely frame to set off your embroidery more than ever! 6.86" x 9.98" and 5.86" x 8.52"
6.85" x 9.13" and 5.85" x 7.80"
5.14" x 6.85" and 2.89" x 3.85"
Alexander McNab was a sheep herder in Scotland and experimented with breeding to develop a phenomenal herding dog: the McNab Shepherd. 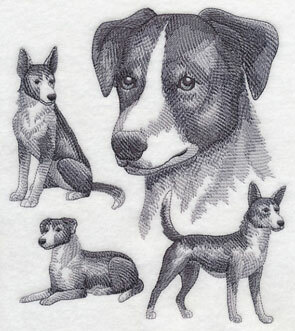 These brave and energetic dogs can herd animals of all sizes, from little sheep to cattle! Susan's best buddy is a McNab, and she requested a sketch medley in his honor. Thank you, Susan, for the suggestion! 5.86" x 6.75" and 4.86" x 5.60" and 3.35" x 3.86"
The Request of the Week program is one where you can request a design for us to draw and digitize. to read your ideas. 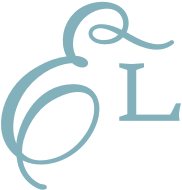 Send your suggestions and design requests to support@emblibrary.com. 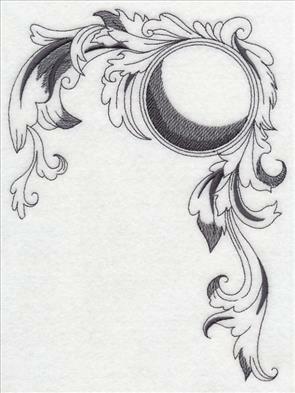 We'll add them to the growing list of designs to be created!